The first day of the tour provide exciting mountain flight across the giant Himalayas right over Mt. Everest. After you arrive in Lhasa the land of lords you will be welcomed by our ever friendly, professional staff. You will spend 2 full days observing this ancient commanded by the amazing palace Potala Palace atop the hillock in the middle of the city and filled by monasteries, nunneries and other cultural heritages. After Lhasa, you will drive along the friendship road towards Nepal border. The snaky road along the patchy terrain offer excellent view of Himalayan peaks including Mt. Everest, Cho-oyu, Xisapangma and many others from the northern side. The towns you encounter on the way serve as historic sites and home of cultural heritage of this overwhelming Himalayan Kingdom. The tour ends at the border of Nepal-Tibet at small town of Zangmu where you will say good bye to your Tibetan staff and be welcomed by Nepali staff before culminating your trip in Katmandu. DAY 01:Katmandu - Lhasa (3650M) Flight by China Southwest Airlines. The flight duration is 1 hr and 10 mints. and it is one of the most beautiful flights in the world. On your Flight you will see the Yarlung Tsangpo River, Lake Yamdruk, Kanchanjunga, Makalu Pumori, as well as Mount Everest including other mountain peak. 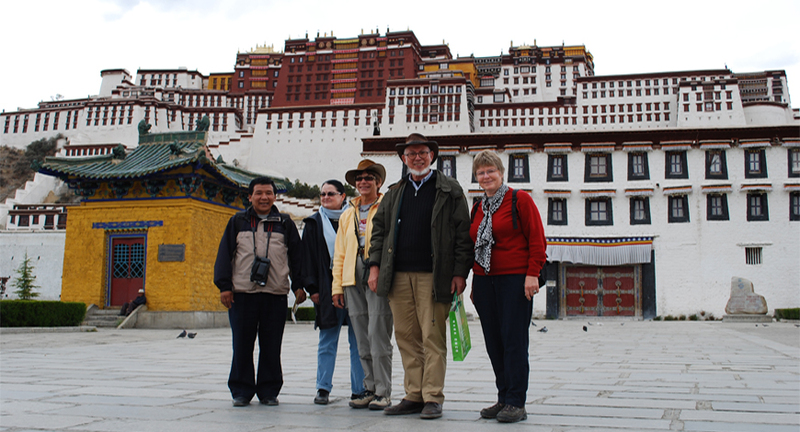 UPON ARRIVAL You will be meet our Tibetan Guide and transfer provided to Lhasa City. Overnight at Hotel. DAY 03: Tour of Drepung and Sera monasteries and overnight at Hotel. DAY 04: Sight seeing tour of Serlung Gompa and drive back to the same Hotel. DAY 05: Lhasa-Katmandu after breakfast drive to airport 63 Km And fly back Katmandu.